China has always been a fascinating subject for me. Their recorded history spans over 6,000 years. But the time period that has always interested me the most are the years between the Boxer Rebellion in 1903 and the Cultural Revolution of 1966. These years are filled with the story of a nation struggling to right itself after thousands of years spent living under fuedal warlords in a land too large to be Governed Centrally, given both the large distances and the limitations of communications technology at the time. Before World War Two,China was engaged in an internal struggle to rid herself of the foreign powers that had literally carved her up into commercial zones. Politically, the country was constantly in upheaval, as the Nationalist forces struggled against the Communists forces for control of China's political destiny. Would the Nationalists prevail, or would the country go Communist? That question had to be put on hold as the Chinese people cast aside their internal differences to battle a common enemy; the Japanese agression of the 1930's and 1940's. When the war ended, the Chinese, under Mao Tse Tung, forced Chiang Kai-Chek into exile on the island of Formosa, and established the Communist government we came to regard as "Red China" on the mainland. Growing up we were told in school all about the advances in literacy and agriculture, as well as industry, that were being made there under Communism. This was all done in an effort to teach us tolerance of other forms of government. The implication was that to be a Communist doesn't automatically make you the enemy. And China has evolved into a major player in every aspect of the world, both economically and industrially. But the path to get there was long and hard. The abuses heaped deliberately upon the Soviet people pale in comparison to the arbitrary decisions that were made by Chairman Mao, affecting one quarter of the worlds population. The abuses and insanity of the Cultural Revolution are well documented, as in Ji Li Jiang's wonderful memoir "Red Scarf Girl." Having lived through that time here in America, I had some knowledge of something happening in China, through TV and news reports. 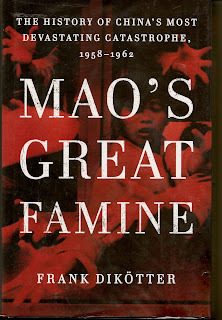 But until recently I had never known that China suffered a massive famine between the years 1958 and 1962. 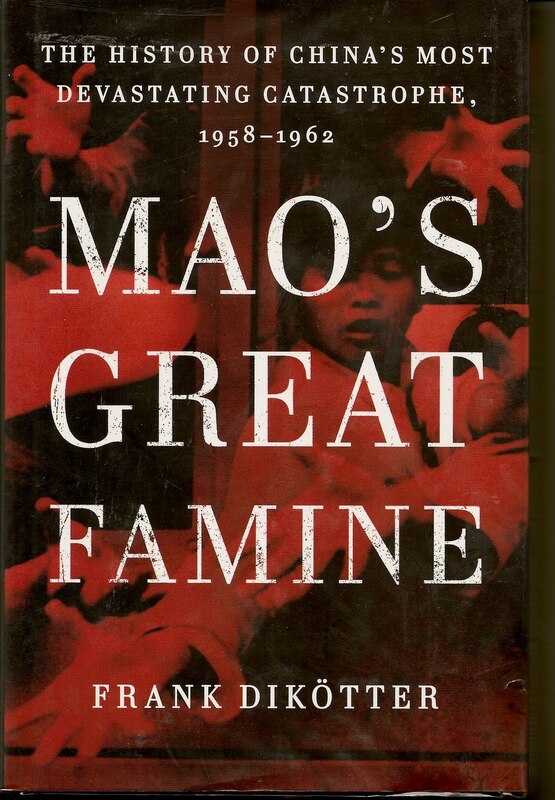 "Mao's Great Famine" is the story of that period, officially called The Great Leap Forward. It is unimaginable, to the average American, to live in a country which is so underdeveloped, that the Government would send operatives door to door to collect any metal, or tinware, that was in your home. This metal would then be taken to a collective, or community, furnace for smelting into steel. The result was often inferior "pig iron." Still though, you had to turn it all in to meet the quota. It didn't matter that it was no good. So you just passed it on. Multiply this by millions. Now imagine having lived in an agricultural community of the same country, where there were quotas set on your production. It doesn't matter if it rained, or not, you still had to meet your quota. So, many farmers hid some of the food for their own families. Multiply this by millions. This is the way the "Great Leap Forward" played itself out. Before it was over, millions of people had died of starvation. Millions of others had died from disease and overwork in inferior steel mills and other failed industrial efforts. The economic system was utterly destroyed, replaced by a black market system trading in various state issued coupons. Many of these coupons were restricted to the area in which one lived, which in turn restricted an individuals ability to move about freely. In cases like that, black markets offered, for sale or exchange, other coupons. Cash actually lost it's purchasing power. One of the major effects of all of this was the mass migration of farmers from the countryside into the cities. Forced to give their crops to the state, and then subsisting only on what the state allowed them to keep, was so dispiriting that many simply left the farms. The wages, and coupons, that could be earned in factories seemed like a much better idea. But upon arriving in the cities the average worker found himself underpaid, and often underfed, as the cities began to feel the pinch of the overcrowding, as well as the dwindling amount of food being produced. At that point, every one is forced to go home. This is one of the best books you will find concerning the failed policies of the "Great leap Forward." Mr.Dikotter has done an excellent job in making the subject both informative and readable. Given the complexity of the material, this was not an easy thing to accomplish. The book is comprehensive and well written. It is not designed to look down upon, nor to ridicule, the policies of the past in China. More than that, it serves as a spotlight on a very dark and often misunderstood period in modern Chinese history. The more that is written about China under Mao, the more one has to wonder, how did so many, allow so much, to go wrong for so long a time.